Revenue in the Minivans market segment amounts to US$20,028m in 2019. From an international perspective it is shown that most revenue is generated in China (US$24,526m in 2019). The Minivans Market segment includes passenger cars of an average footprint around 4.25m2 (46 ft2) and an average mass around 1600kg (3500lbs), with their roofs extended in the back in order to prioritize their passenger and cargo volume (up to 3.7 m3 or 130 ft3). Some of their distinct features include sliding doors, three rows of seats and a passenger car base. Although different variants of minivans existed ever since the 1930’s, their design changed drastically over the years and until finally settling into the one we know today in the late 1960’s. Many predecessors spin-offed into their own car classes, like camper vans and pick-up trucks, while minivans found their ground in early 1980’s replacing station wagons as the new family cars. This market segment continued to flourish until the financial crisis of the late 2000s, after which many minivan models started to be reimagined as small SUVs, following new market trends towards Sports Utility Vehicles. Example Models: Citroën C3 Picasso, Citroën C4 Picasso, Mazda 5, Peugeot 5008, Peugeot 807, Toyota Verso. 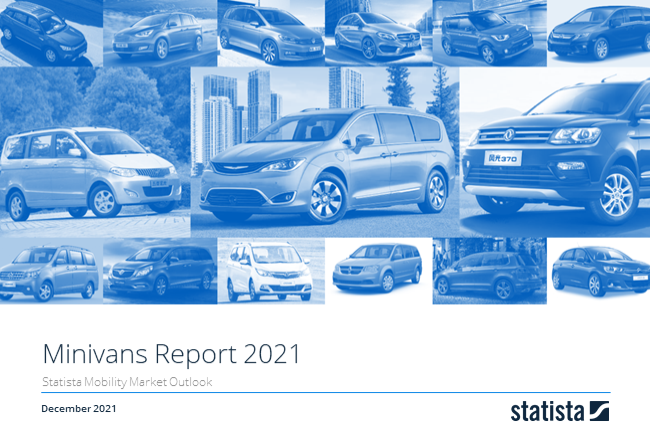 Reading Support Revenue in the Minivans market segment amounts to US$20,028m in 2019. Reading Support In the market for Minivans, volume is expected to amount to 785.4 t cars by 2022. Reading Support The average price per unit in the market for Minivans amounts to US$23,328 in 2019. Reading Support With a market volume of US$24,526m in 2019, most revenue is generated in China. Here you can find more studies and statistics about "Minivans".